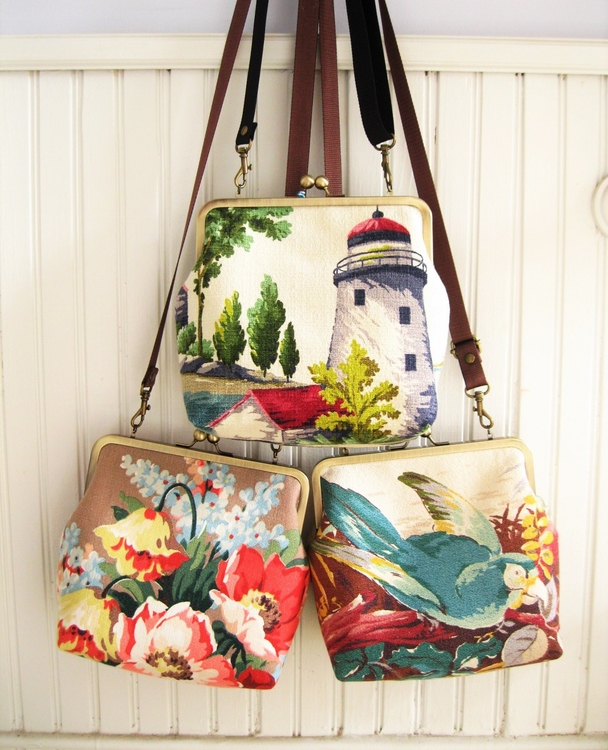 Constance Scott handcrafts fashionable womens purses and pillows from vintage barkcloth fabric. Barkcloth is an upholstery weight material featuring bright tropicals, regional images and geometric patterns. It was commonly used for curtains and upholstery from the 1930’s to 1950’s. She creates clutch purses in three sizes - cross body shoulder bags, classic clutch style and mini clutch purses. The two smaller sizes also come with wrist straps. In addition, she has an assortment of zippered coin purses, fanny packs, totes and hobo bags. Constance was a jeweler and seamstress before starting this line of bags. She still carries a line of handmade jewelry made from vintage tin under the name Studio C.
Her current company name is taken from the middle names of both of her grandmothers. Come have a look at these unique bags and purses at Sugarloaf Crafts Festivals.